I finally got myself up into an airplane this week and am flying again. Lake County is stunning from the air, though I can see problems from a very different vantage point. For example, the algae is blooming in the Lake and from the air, the green streaks are sobering. Likely, the algae will do this until the lake water cools. I also flew over Dancing TreePeople orchard where I got a good look at "The Big Picture". In a word: it is DRY. The TreePeople are NOT dancing--they are trying to survive the heat and last year's pruning. From the air, I can see that these trees are clearly stressed. The former owner told me that they hadn't been watered for the past few years because it is not "cost effective." They seem to really need it and I feel bad that I didn't catch on sooner. In any case, I couldn't water if I wanted to--the irrigation system isn't fuctioning and needs replacement. When I returned to the orchard after my flight, I took a long walk. The weeds from the summer rains are now completely dry. The ground literally crunched under my feet. I noticed that the trees hold very few Walnuts this season, and the squirrels are claiming a large portion of the meager crop. My neighbor, Raphael (the local expert), told me that this is a very bad year for walnuts because the late June rains prevented pollination. I'm certain that my crop is even worse that most. I have decided that I need to focus the next weeks and months here on capturing and storing water, without which this land will be a desert soon. Looks like I will not have to spend much energy on harvesting walnuts this season and can concentrate on irrigating these trees. Assuming they make it, perhaps next year will be better. When I embarked on this journey toward self-reliance, I fully engaged the most scientific and rational part of myself. Slap a few solar panels on the roof, recycle waste, use a solar oven and grow a few organic crops and I would be well on the path, right? What I have learned is much deeper. It is difficult to put into words, but I will attempt to do so. If one wants to live in harmony with the planet, to accept ones position as a part of the natural system rather than a consumer (taker) of Earth's gifts, then an internal shift is required. This is a change in a way of BEING. Much of what we have been taught about ourselves--how to be happy, how to survive, how to relate--must change. Despite what we have been taught by popular culture since infancy, we do not need more things to make us happy (in fact paradoxically, the more we have, the more elusive happiness becomes). And despite the fact that heros are rewarded and individualism is worshiped in our culture, the most important gifts in the next few decades may well be relationships with neighbors and the cultivation of local community. Why do I say this? Because one cannot possibly have all the skills, or resources, or tools, or creativity or time to be fully sustainable on their own. Even if you could afford it, you would not have the time or strength working alone. And, more importantly, the vision of such a life is unappealing. One needs a life-giving and sustaining vision, a spiritual sustenance, in order to let go of the false promises ingrained so deeply within us. As it turns out, our ability to forge relationships and our own creativity are probably our most important individual gifts. As I harvest the first of our organic vegetables and contemplate the season ahead, I drink in the beauty of the landscape around me here in Lake County...., I am grateful for all I have been given. From the land and trees, to the community of life, and the community of people here. We have all that we need for the times ahead. May we accept that which is entrusted to us and make it better for our community in the generations to come. 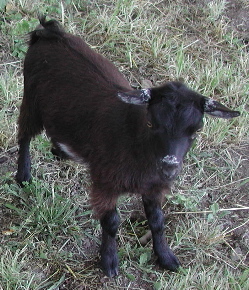 Did you know that Pygmy Goats eat star thistle and bind weed? Woohoo. 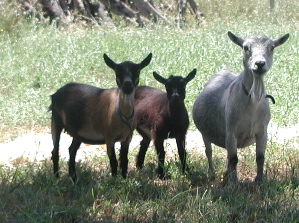 So we adopted three pygmy goats: Sugar, Clara and Daisy. 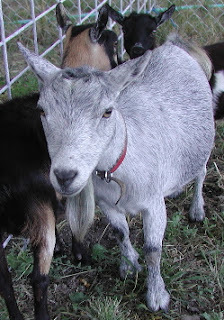 We discovered that these goats are clever about opening gates that aren't fully latched and they will also eat the leaves off of young fruit trees if you aren't careful..
Meet Sugar. She is the "mom" protecting her daughters and talking with them. She gets first dibs on any good food. She likes rolled oats. Meet Clara, Sugar's eldest daughter. She is one year old (more like ten years old in goat years) and is learning that butting her younger sister with her head is fun. I remember feeling the same way when I was ten. 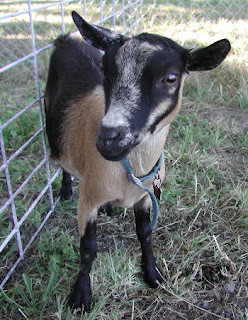 And this is Daisy, Sugar's youngest daughter. She is four months old and still nurses from time to time, ungracefully shoving her mother's udder to release the milk. She also climbs and perches on the "igloo" dog (now small goat) house. She takes naps inside it too. These livestock are a new source of weed control, manure for the organic garden and joy for us.